What? Guided-inquiry, introductory mechanics labs designed to promote students' mental construction of concepts through conceptual conflict, kinesthetic involvement, analysis of experiments in multiple ways with increasing levels of sophistication, peer discussion, and Socratic dialogue with instructors. Intro Article: R. Hake, Helping Students to Think Like Scientists in Socratic Dialogue-Inducing Labs, Phys. Teach. 50 (1), 48 (2012). Intro Article: R. Hake, Socratic pedagogy in the introductory physics laboratory, Phys. Teach. 30 (9), 546 (1992). R. Hake, Interactive-engagement methods in introductory mechanics courses, , 1998. 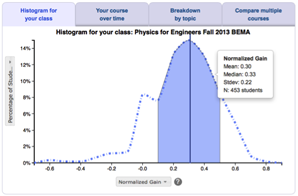 R. Hake, Interactive-Engagement Versus Traditional Methods: A Six-Thousand-Student Survey of Mechanics Test Data for Introductory Physics Courses, Am. J. Phys. 66 (1), 64 (1998). R. Hake, Promoting student crossover to the Newtonian world, Am. J. Phys. 55 (10), 878 (1987). S. Tobias and R. Hake, Professors as physics students: What can they teach us?, Am. J. Phys. 56 (9), 786 (1988).